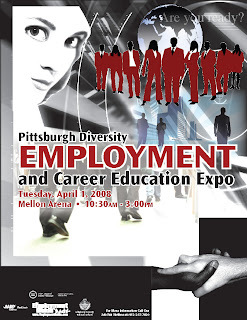 The Pittsburgh area’s next big Diversity Job fair will be on April 1st at the Mellon Arena from 10:30AM to 3:00PM. The job fair is free and open to the general public. No registration is required. Enter at gate 10. We suggest if you drive to park in the east parking lot on the Center Avenue side of the arena (all day parking is just $6.00). With over 35 companies and career training schools in attendance, job seekers will find hundreds of local Pittsburgh job opportunities and information on dozens of career raining opportunities. It is highly suggested that all job seekers brings a supply of resumes (10 or more) and to remember that how they dress will greatly influence their chances of employment success. This job fair is the first Diversity Job Fair in Pittsburgh to be held in collaboration with The Urban League of Greater Pittsburgh, AARP Foundation Work Search and the Allegheny county Department of Veteran’s Affairs. Companies attending are letting it be know they are equal opportunity employers looking for the most qualified candidates regardless of race, age or veteran status. 35% of Pittsburgh area employers plan to expand payrolls in the 2nd quarter, according to the Manpower Employment Outlook Survey released today. Only 5% plan to reduce payrolls, according to Manpower spokesperson Kelly Scott. For the coming quarter, job prospects appear best in Construction, Durable Goods Manufacturing, Finance/Insurance/Real Estate and Services. Employers in Transportation/ Public Utilities and Wholesale/Retail Trade voice mixed hiring intentions. Hiring in Non-Durable Goods Manufacturing, Education and Public Administration is expected to remain unchanged.